The San Diego County Water Authority Board of Directors voted Thursday to raise water rates for the 2015 calendar year by 2.9 percent for untreated water and 2.6 percent for treated water. The increases are on the low end of what was proposed last month. The water authority sets rates based on the cost of imports from the Metropolitan Water District, the primary water wholesaler in Southern California, among a variety of factors. Added to the formula this time is the cost of receiving water from the desalination plant being built in Carlsbad. That facility could begin pumping water in fall 2015, officials said. The board also approved a $1.5 billion budget that reduces spending by $37 million, or 2.5 percent. The spending reduction is in large part due to a $53.9 percent cut in capital project expenses, offset some by an increase in costs for water purchases. 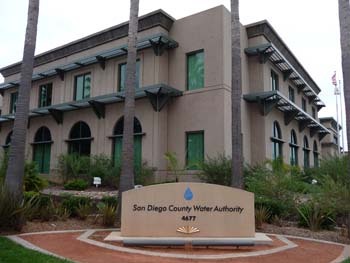 The water authority sells its water to 24 local agencies, such as the city of San Diego and Helix Water District, which distribute water to residential and commercial customers.